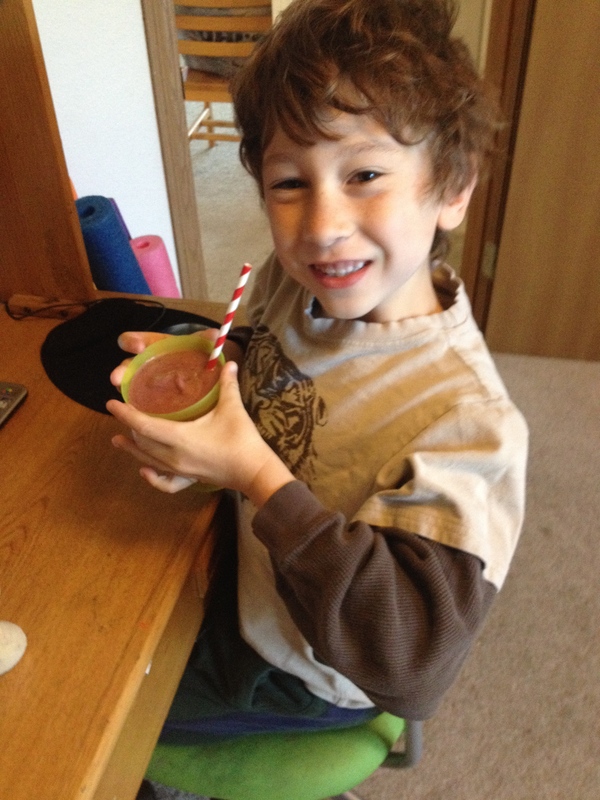 Our whole family love smoothies and I make them weekly in our house. I love knowing exactly what my kids are eating and knowing that I can use up all of my old, mushy fruit so we waste less. In fact, the more we eat smoothies, the better we feel (especially in the summer – it’s a great way to cool down). You don’t have to buy new stuff to make great smoothies, but I totally get it why Will Smith was passionate about his blender in “Enemy of the State” (watch it: worth your time) – I’ve gotten two for gifts over the years and my excitement grows with each new blender. Get yourself set-up to be organized by creating a small space in your freezer for the smoothie supplies. You’ll also need some way to store the old, mushy fruit in individual servings (we use reusable containers or sometimes ziploc-style bags) I always have smoothie ingredients ready to go in a small plastic bin in my freezer filled with smoothie ingredients. It’s much faster to grab the items I want in the morning easily and whip up a unique blend for my smoothie. Make better ice cubes for Smoothies. Sure, an icy smoothie is my favorite, but sometimes the ice can make it taste watered down. Now, I make ice cube in advance. I use nearly expired yogurt, the juice from canned fruit, or extras from when I make too much smoothie to make flavorful ice cubes that add more nutrition to my smoothie. Just pour the extras in a dollar-store ice cube tray and freeze. You can bag them up and pick out what you want when you need it. Be smart with the extras. We make our smoothies in mega batches. Usually everyone in the house gets their own reusable, insulated cup. And we’ve also started freezing our extras in Popsicle containers. 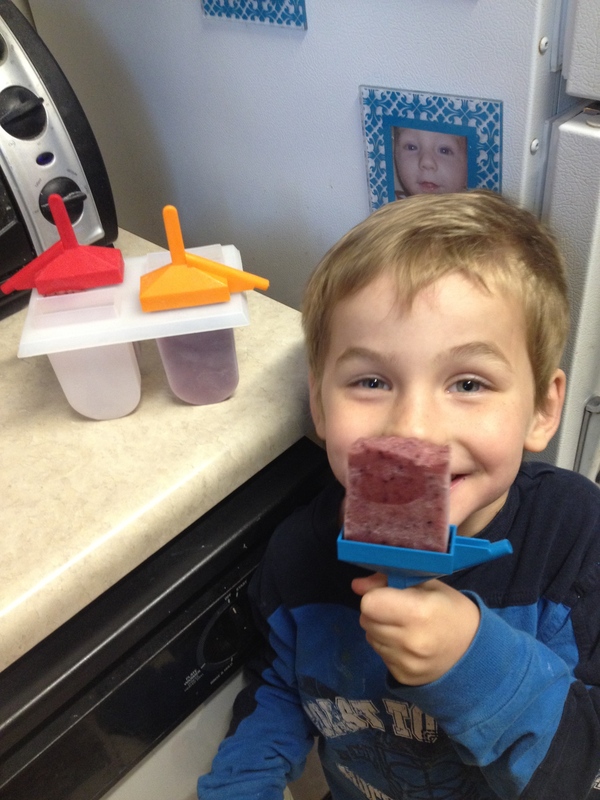 The kids are ecstatic when they get to eat Popsicle for breakfast – and it’s just fruit, ice/water and spinach! Yum! Smoothies are a fun, easy, healthy addition to your diet. Use these simple tips to make them a regular part of your meals. There for a while I was eating some type of candy, dessert, sugar every day. Every Day. That is 365 desserts a year, and that is if my portions were just one serving (and they probably weren’t). I knew this was a terrible idea, but I loved sugar so much and I felt like I really needed it. And it turns out, I was in a cycle where I really did need it (look at the picture above). Very soon after I ate the sugary-items, I’d crash. I was grumpy and had trouble thinking. Then I felt like I needed to eat more sugar to get back to good and kept doing this over and over. I was pretty miserable, but I didn’t know exactly how dangerous this cycle had become. 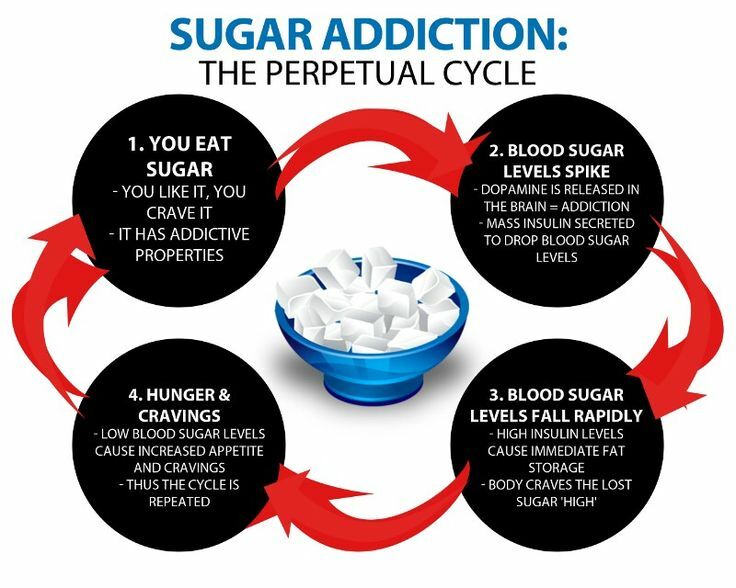 If you’re in the same cycle right now, I encourage you to start making changes, like I’m currently doing, to help overcome your sugar addiction. Understand Dangers of Sugar (and Sugar-like additives). I’ve been reading articles about how to reduce this and live a healthier lifestyle. One of the articles I found said a high-sugar diet makes it harder for your body to transport bad cholesterol out of your body and increases levels of triglycerides, or fatty content, in the blood. Short answer: Not good. And sugar was doing this to me. Looking at the above list, I was also getting regular headaches and I was having trouble concentrating. 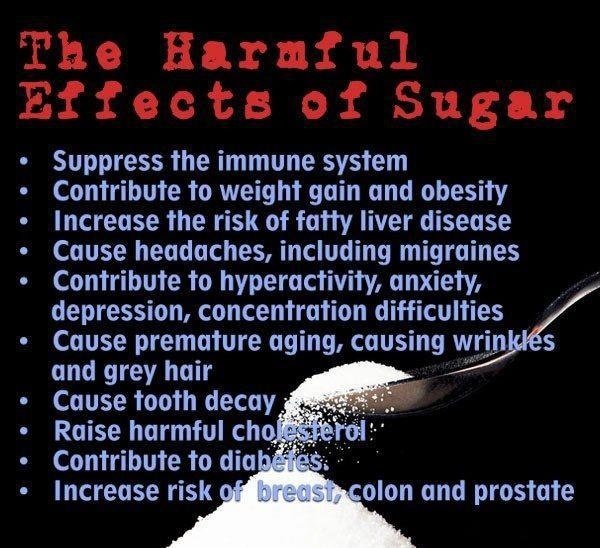 And don’t think you’re safe if you eliminate only white table sugar. You need to check your food labels for types of syrups (high fructose corn syrup), sugars and additives (like equal, stevia) and work to limit all of these. I already knew it, but once I read through all of this information, it confirmed I had to make some changes. 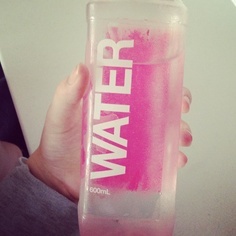 I drink a lot of water, but I wasn’t really using this healthy beverage to my advantage. Now, when I’m getting hungry, I drink 20-24 oz of water first and then walk around for 5-10 minutes. This has multiple benefits: I’m drinking more water, I’m distracting myself from hunger until I learn if it’s really hunger and all those trips to the faucet are giving me more steps on my pedometer. I’ve always been a frugal meals person, but when I’d pack my own breakfasts and lunches for work, I wasn’t packing enough and I was starving in the afternoon. Then I’d load up on the sugar and start the daily cycle. Since reading more into sugar addiction, I changed my meal planning and what I was eating on a regular basis and now I make it through most days with no sugar, and even no snacks! I’d encourage you to read more about plans that eliminate sugar like Whole 30 (my favorite). Eliminate Hidden Sugar From Your Diet. You’d be surprised how much sugar is hidden in foods. This was the EASIEST sugar decrease for my healthy eating plan. By reading nutrition labels, our family adjusted many of our purchases to include healthier items (real ingredients, more homemade items)and now, the foods we’re eating taste better, are better for us and we’ve eliminated all hidden sugars from packaged and processed food. I promise you don’t need sugar in your pasta sauce, your canned fruit (buy 100% juice NOT “no sugar added”) or your pizza crust. 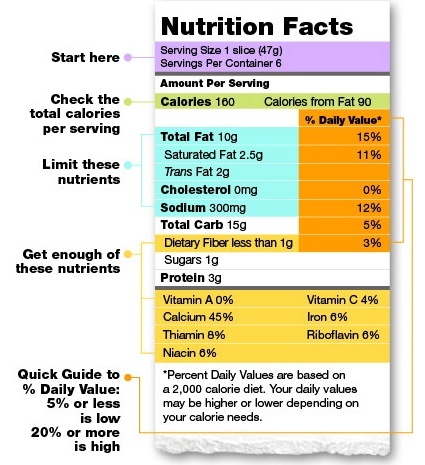 Read the nutrition labels to figure out which foods are healthier and have less sugar to save your health and reduce your calorie intake. 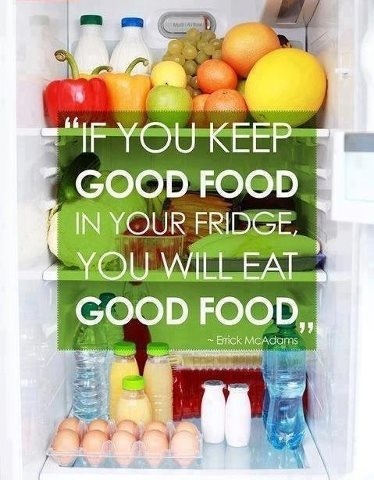 If you’ve been thinking about homemade options, I encourage you to start some of the foods yourself. We’ve been making great use of our slow cooker. Our bread machine has helped us with pizza dough (a “sometimes” treat). With my new healthy-eating breakfast & lunch plan, I’ve made it easy to follow this tip, because that is the only option that I give myself. But for dinner each night, I have to remember this strategy. Since we eat meals together, I could really choose whatever I wanted. So I plan a variety for dinner each night and eat the healthiest items first. Then I make myself wait an hour before eating again. If I’m still hungry then, I’ll let myself have a snack. 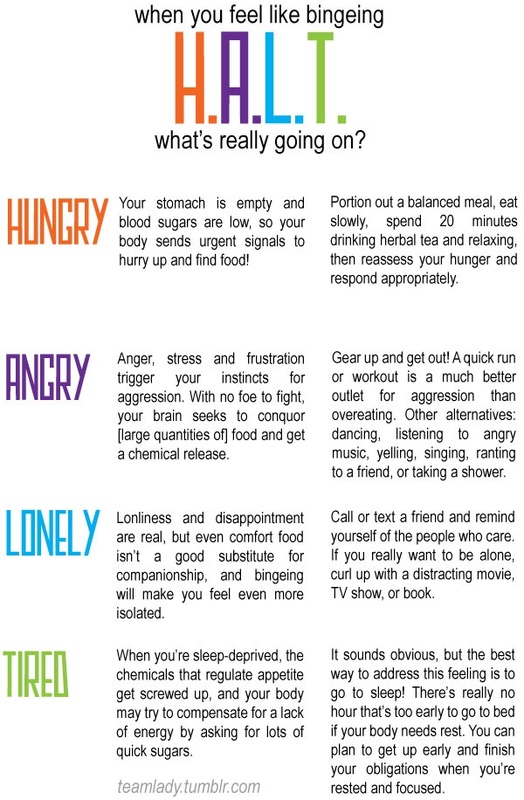 But, I’m usually not hungry, because my food just needed time to settle–so far this plan has worked great. Don’t keep Sugary-Foods Easily Accessible. When I have sugary-foods that I like easily accessible, then that is what I want to eat. I’ve found it’s easier to keep them away from me, it’s much easier to stay on track. I’ve also found it’s easier for me to not have anything than to try to have a small amount. So when I’m faced with the opportunity to eat sugar (like birthday party cake or a staff meeting muffins). I just say no, and then sit where I can’t see the food or wait until everyone else has eaten it all, so I’m not tempted. I’m not saying it’s been easy. I love sugar and I don’t really want to change, but I know that I must make changes and that is exactly what I’ve been doing. Most days, I’m now able to control my sugar-cravings and it’s getting easier and as I continue to reduce the sugar (both hidden and dessert-based) in my diet. 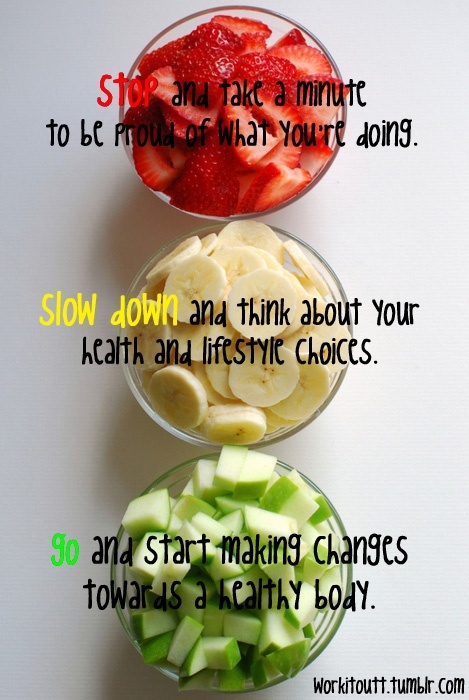 I’m making progress, slow and steady, toward my healthy lifestyle goals. You can do it too. Take one day at a time, with whatever your addiction is, and you can make the progress you need to reach your goal. Seems like everyone, at one time or another, has been on a weight loss or wellness journey. I’m telling you, it can be done. You can lose the weight you want, but you have to figure out what you want to achieve and stick to it. I gained 60 lbs with my second son (thank you iron deficiency and near bed rest). It took me 18 months to lose the first 30 lbs because I didn’t use the strategies that I’m going to tell you. Then, one day after trying on my fabulous professional clothes (and they still didn’t fit), I realized I needed to make some changes–because I wasn’t buying a new full wardrobe sheerly out of principle. My current clothes were great, I just needed to be able to fit into them. Once I made some important changes, I was able to lose the last 30 lbs in 6 months. It wasn’t easy, but it was worth it.